Sometimes when I call my wife the first thing I ask her is, “Where are you?" The answer to that question will tell me a lot about what she’s doing - in the laundry room, at Target, at the Bank... Where you are and what you’re doing are intertwined. And we can even think about this beyond physical location; we can think about where we are emotionally, spiritually, relationally... Where we are matters. Do you know the first question recorded in the Bible? It’s in Genesis 3:9. But the Lord God called to the man and said to him, “Where are you?" And here’s the answer: Adam was in the woods - naked and afraid. He was hiding from God because he had broken trust with God. He had been disobedient. Ever seen a child run and hide when they know they’ve blown it? I don’t think God asked Adam where he was because he couldn’t find him. This was a diagnostic question. What’s going on, Adam? Where are you right now? The question gave Adam a chance to be honest. The question called him back to God. This past week I did an experiment. I set random alarms on my phone. Well, they weren’t totally random. I thought about my normal routine a little bit when I set the times. 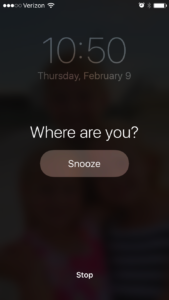 If you have an iPhone, you can label the alarm, so I called these alarms, “Where are you?" Now I’m periodically interrupted with this question, and I imagine God as the one who’s asking. The first day of my experiment, my alarm went off right after I angrily and impatiently yelled at a guy for driving too slow! God was asking, Hey Jon…where are you right now? And the honest answer was: I’m in my truck, yelling at another person who can’t even hear me! And then I prayed: God, I’m sorry for being so impatient. Thank you for being so incredibly patient with me. Help me be more patient today…with my kids, my wife, the people I encounter. Another time I was in the dentist chair when the question popped up! I prayed I wouldn’t have any cavities! I also thanked God for good healthcare and the provision to pay for dental services. I need my teeth. I love eating too much. One more - my alarm went off while I was doing some work from home. “Where are you?” Hey Lord, I’m at home, working on my sermon. It’s so peaceful and quiet here. Thank you for this home. Thank you for my wife and children who are normally here but are at school and work right now. Watch over them today. I then prayed for specific things my kids had going on at school that day. The whole interruption took about 4 minutes. Then I went back to work. So where are you right now? Are you reading this on your phone? On your couch? At a red light (don’t answer that)?! In the checkout line? Where else are you? Frustrated? Scared or anxious? Thankful? Stop and pray. Here I am, Lord. Please meet me here. Now go set some random alarms to interrupt your day! It’s a great way to stay connected with your Heavenly Father! Jon Teague is the Family and Teaching Pastor at Two Rivers Church Chattanooga.